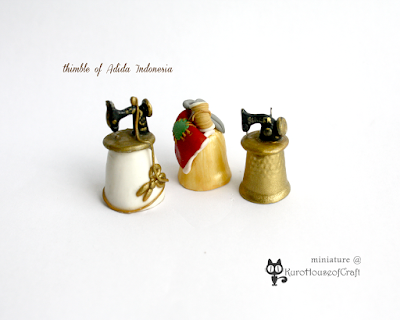 Hi, today I'm gonna show you some of my thimble collections from polymer clay. I make it from Mofa polymer clay and I use acrylic paint for the gold accents. These thimbles size are just same like normal thimble, you can put it in your finger. but this is not gonna used like real thimble, it just for miniature. So I make miniatures of old vintage sewing machine, the smaller one I wrote it as "singer". I actually made another one, just a small 3D painting thimble using clay. you can check on my instagram here and please be happy to follow my instagram. I think I want to make more thimbles ^ ^ it kind of addicted. What temperature (F if possible)do you cook your MOFA clay at. I can't read Mandarin and can't seem to find it ANYWHERE online!! you can find it in taobao, but search by using "magic clay mofa"